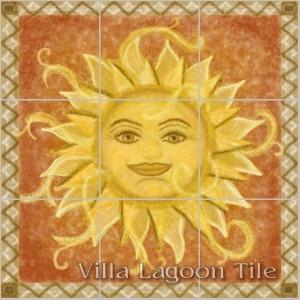 Using our up-to-date reproduction system, we can duplicate any image you want on 4.25 or 6 inch tiles. 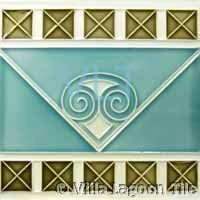 We can also reproduce antique tiles at a fraction of the cost of the originals. 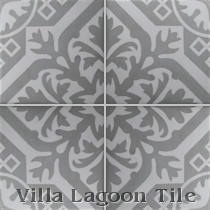 Our tiles have a flat surface, not the actual texture of the relief tiles, but they do fool the eye ! 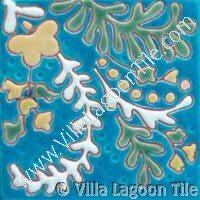 All tiles are made to order. Tile orders, as well as shipping are now handled through our fulfillment partner, Zazzle. For information about the return policy, or links to over 20 international versions of our storefront, visit our Zazzle information page. 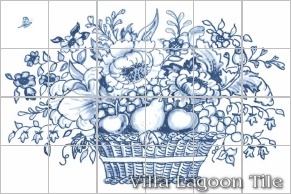 We are happy that Victoria Magazine chose several of our blue and white ceramic tiles for the annual Blue & White issue. One is in our Relief Tile group and the others are Victorian Transferware reproduction tiles. We are now offering durable ceramic tile in patterns that match our cement tile as well as popular motifs, and custom designs for kitchen backsplashes, fireplaces, baths and showers. American Encaustic Tiling CoVan Briggle Pottery & Tile Co.
First and foremost the purpose of a backsplash is a practical one. Consider the kitchen first. The kitchen's backsplash acts as a protective barrier that shields the wall’s surface against the splatter of cooking and the water that splashes while washing dishes and filling big pots. Depending on the layout of the cabinetry, the backsplash area on average comprises between 5-20% of the visible wall area in a kitchen. Typically backsplashes are only 18” high, so the backsplash is the perfect space to showcase accent and specialty tiles in small quantities without spending a fortune. Our minimum is only six accent tiles. Selecting materials that complement each other and blend well is imperative for a successful backsplash design. Because natural stone has become such a prevalent choice for countertops, tile on the wall is a way to add some much needed color to the kitchen. Regardless of your taste, there is a vast array of tile designs that all function beautifully in a backsplash application. As is the case with all installations, the backsplash, tile and grout, should be sealed with an impregnating sealer to ensure ease of maintenance. We have accent pieces that blend well with natural stone when it is uses as a backsplash, and add a punch of color or contrast to the space. Mosaics, metals in various colors and finishes, and decorative ceramics are often paired with natural stone. The most important part of designing a backsplash is to realize that while it does have an impact on the overall look, it is best to leave the backsplash decision as one of the last decisions to make in designing a kitchen. The cabinetry and countertop materials represent a much greater investment and are visually more substantial. The backsplash is one of the last design elements to be installed. Waiting until the cabinetry and countertops are installed prior to making a final decision on the backsplash give you one last opportunity to alter the look of the kitchen if you need to. For example, if you are concerned that the kitchen is looking darker than you thought it would, a light backsplash can brighten up the deep tones. A backsplash can bring together all the elements of your kitchen. It can help to blend the colors, textures and patterns of the floor, cabinetry and countertops. It is also an opportunity to personalize your home and set it apart from the other kitchens in the neighborhood. With some creativity, the walls in your kitchen will not only be protected from splatters, they will become an attractive addition to your overall kitchen design. 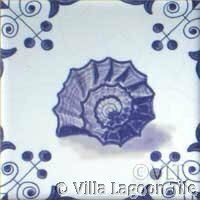 For backsplashes we offer handcrafted decorative tiles in Arts and Crafts, Art Nouveau and Art Deco styles for baths, kitchens or fireplaces. Custom services. Field tile.